Ships within 7 business days. Please allow up to 1 additional week transit time for your item to arrive. 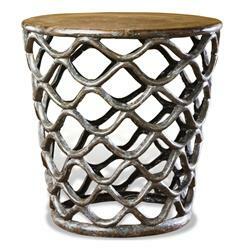 Based upon a French antique, this table delivers textural interest and a surprisingly light, airy feel. A rustic classic, its tough enough for outdoor use, but with fine details like fishtail latticework this piece fits right into modern or more traditional interiors with ease.